This hugely versatile and contemporary suite can be dressed to suit all types of living spaces. 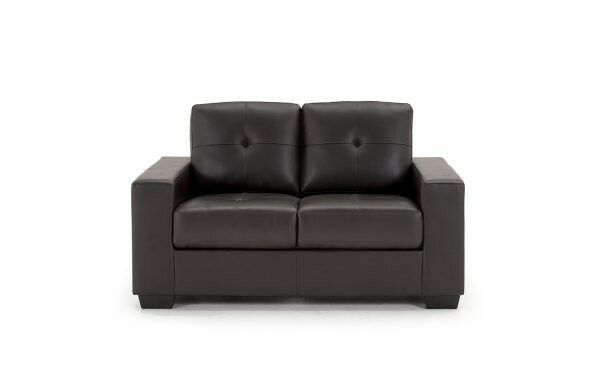 Upholstered in brown or black bonded leather and leather match. This Irish hand crafted sofa is upholstered and available in a large selection of only the best quality fabrics. Character leather sofa with cosy woven seats, available in a wide range of leather and fabric combinations. Each piece of top quality, fully natural leather, sustainably sourced from around the world, bears unique variations in shade, grain and texture, further adding to the sofa's charm. Also available as a 3 seater and wing chair. Gunmetal Fabric with Grey Leathaire Frame Also available in claret. Character leather sofa with cosy woven seats, available in a wide range of leather and fabric combinations. Each piece of top quality, fully natural leather, sustainably sourced from around the world, bears unique variations in shade, grain and texture, further adding to the sofa's charm. Also available as a 3 or 2 seater. Elegant accent chair with neat pleated arms and hand-tufted buttons. Chic, slim legs add extravagance to the chair. A curvy chair collection to curl up in, available with or without hand tufted buttons. Available in a variety of soft velvets, flocked textures, fancy patterns and smooth, buttery leathers.